Dylan Sumner's FA Youth Cup semi-final strike for Blackpool against Arsenal has been nominated for a goal of the season award. 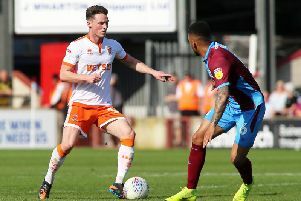 The midfielder, who has since been released by the club, equalised for the young Seasiders during their first leg 2-2 draw at Bloomfield Road back in March. He finished off a slick move by latching onto Will Dunne's knockdown before rifling home into the bottom corner of the Arsenal net. The strike is among eight goals to be nominated for the League Football Association's goal of the season award. This celebrates the best goals scored by academy sides during the 2017/18 season. Voting will remain open until noon on Wednesday. You can vote for your favourite goal via an online poll or via Twitter using the hashtag attached to each goal. To cast your vote and to see a video of the nominated goals, click here.